Left: Student Council members, University System of Georgia Evening School, 1934. 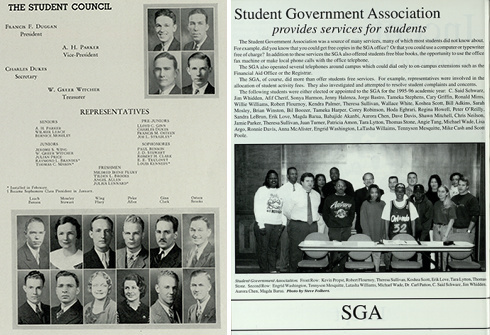 Right: Student Government Association members, Georgia State University, 1996. Georgia State University’s yearbooks are now available online. The digital collection includes annual yearbooks dating from 1934–when the college became the independent Evening School of the University System of Georgia, having previously been a unit of the Georgia School of Technology–to 1996. During the 1930s and 1940s, the school had separate day and night divisions; the divisions published separate yearbooks, meaning that some years will have more than one volume. The yearbooks had various names throughout the years, including Nocturne, Survey, Junior College, Gateway, and, most recently, Rampway. Users can browse the collection by decade, by date, or by the name of the institution (the college went through several name changes before becoming Georgia State University in 1969). This entry was posted in Digital Collections, For Faculty, For Graduate Students, For Students, Primary Resources, Resources, Special Collections & Archives and tagged digital collections, yearbooks. Bookmark the permalink.